At last! Fleaster's finally here! But while the chocolate's flowing, the whipped cream invading your mind, not forgetting a glacé cherry, a crucial question comes up on top of everything else: "oh dear… but what am I going to put on?" Does the Hunter costume ring any Fleaster bells? You read that right: Today, you have the chance to take control of your own robotic Ogrest! To do so, take advantage of one of the two packs available until Sunday, April 14. Just one question: with or without a Meka mount? 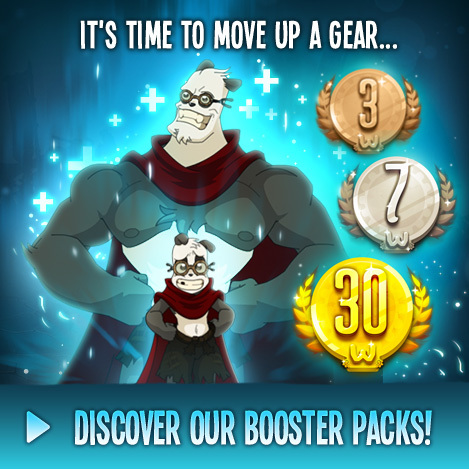 Do you know how to get discounts on 30-day boosters and a free mystery box every month? It's simple: You just have to choose "recurring payment". Let us tell you more! Starting today through April 3, the Komet pet will be yours as a bonus gift with any purchase of €20 or more in the Ankama Shop! Now's the time to treat yourself. Don't miss out! For a while, it was thought they had disappeared, but the Huppermages escaped the Chaos! Take advantage of their mastery of runes and balance thanks to the Huppermage Pack, available until March 17! Let's all have a Karnaval vibe! Get your feathers, masks, and glitters, until Thursday March 7 11:59 PM, it's party time!